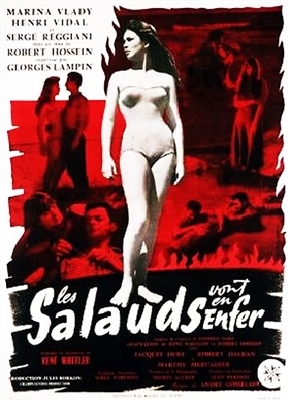 The title of this French prison drama loosely translates to Heels Go to Hell. Making his directorial debut, Robert Hossein also assumes the leading role, playing an escaped convict. Hossein and his fellow escapees cross the path of Marina Vlady, with whom they all fall in love. Alas for our "heroes," Vlady intends to avenge the death of her sweetheart at the hands of Hossein and his confreres. Not only do these heels go to Hell, but they do so with a spectacular flourish. Les Salauds Vont en Enfer was adapted by Rene Wheeler from a play by Frederic Dard. Fast delivery of hard to find French film. Thank you!